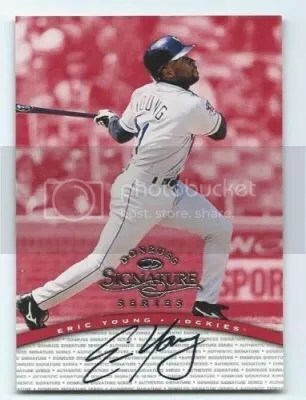 This contest is for a Eric Young 1997 Donruss Signature Series Auto. Good luck!!! This contest will end Friday, January 30, 2015 @ 8:00 p.m. EST. Sunday entry – thanks as always! Love it! I am a 90’s collector freak!! This would be a sweet score! Thx for the chance? Matt would like my entries? Thanks for having these contests…..